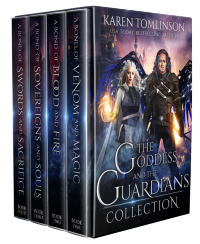 This digital boxed set includes all four books in the Goddess and the Guardians series, more than 1,500 pages of fantasy, romance, magic, and fae! A half-fae village girl with undiscovered power. A vicious fae warrior with a conflicted heart. And a bond powerful enough to strengthen them both, or tear their world apart. When Diamond Gillon's home is brutally attacked, she is catapulted into a terrifying, war-torn land where legendary beasts arise, magic is condemned, and half-blood fae like her have no rights. Inexplicably, she is drawn to Commander Hugo Casimir, a ruthless elite guard owned by the cruel, immortal fae queen. Forced by the queen to train her magic, Diamond becomes a weapon. Now she must triumph against the queen’s enemies or see those she loves, die. Commander Hugo Casimir believes he is good for nothing but ending lives. To endure his servitude to the queen, he has built a wall around his heart and hides it away from the world. Only when he meets Diamond does he consider that his life can mean so much more, that he can be so much more. Prepare yourself for magical lands, heart-pounding battles, sailing through vast oceans, and flying with fierce dragons in this epic romantic fantasy that fans of Sarah J. Maas will love. This breathtaking series is the read you never knew you were waiting for. Dive in now!